Watering your lawn, cutting your grass and fertilizing your lawn are three very important steps in your lawn care regiment. These steps help ensure a healthy lawn. Healthy lawns help ward off lawn weeds, insects and disease. Water for your lawn can come from 2 different sources. Water for your lawn can come from 2 different sources. The primary source is nature. Rain is a great and inexpensive way for your lawn to get the necessary water. The second source is by the homeowner using a garden hose and sprinkler. This method is more costly because the homeowner's water bill will likely be impacted. Also, throughout the country there are watering restrictions. Check your town, city or municipality for days of the week and times of the day that you can water your lawn. A combination of both sources works best. During the growing season your lawn needs approximately 1 inch of water per week. Watering your lawn in the morning or early in the day is best. 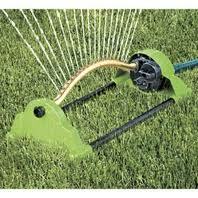 Watering your lawn in the evening encourages diseases such as fungus and/or mold. Pay special attention to the hard to reach areas like the edges and corners. Sometimes watering these areas by hand works best. When you do water your lawn, water deep and less often. Ideally, you want the water to soak 6-8 inches into the soil. This helps the grass roots grow deeper into the soil which will help your lawn become more drought tolerant. If you know that a drought is about to begin and the temperatures are going to be real hot let the grass grow longer than you normally keep it. If you must cut the grass, raise the deck on the mower. By allowing the grass to remain longer than normal, it will shade itself. If you properly fed your lawn in early spring and again in early summer, it should be in good enough shape to make it through a long hot, dry summer. If your lawn starts to go dormant during the height of the summer, let it. Otherwise, you may harm it. Remember, a healthy well fed lawn will green up and bounce back once the weather conditions improve. Visit the lawn watering tips and techniques page for more information. Purchasing the right sprinkler system/irrigation system is important. 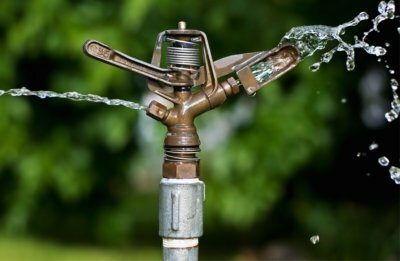 For smaller and medium sized lawns there are 3 types of sprinklers. Impact Sprinklers- Provide the most even watering pattern and efficiently covers large areas. Impact sprinklers throw a pulse of water in a circular pattern. Some sprinklers allow you to adjust the pulse so smaller areas that it waters are only in a portion of a circle. Oscillating Sprinklers- Water comes from an arm that moves back and forth in an arch across the area. Your lawn is watered in a rectangular pattern. Water can evaporate at it's highest point in the arch. Older models dispense most of the water by the sprinkler and at the very end of the spray pattern. Newer models distribute water more efficiently. Traveling Sprinklers- They have the most uniform water distribution pattern. A traveling sprinkler has a head that revolves and is attached to a tractor that runs along your hose. The water is thrown in a circular pattern. You don't have to move this sprinkler because it moves down the length of the hose. When you lay out the sprinklers path make sure that it will cover all areas of your yard. For larger lawns you may consider an in the ground irrigation system. These systems can be very expensive but you can water your entire lawn by turning on a switch. This is a consistent and efficient way to water your lawn. If you decide to install an in the ground sprinkler system be sure to check with your village/town because they may require that you drill your own well. You can have the automatic lawn sprinkler system professionally installed or you can install the system yourself. Yes, I did say these words, you can install the automatic sprinkler system all by yourself. This e-book, "How to Build Auto Lawn Sprinklers", is a helpful guide for someone that wants to install the system themself and save a lot of hard earned money. The book is written by Scott Young, a lawn sprinkler service professional. Click here to learn more! Remember watering your lawn is one element of the all important triple play (mow, fertilize and water) in having a beautiful and healthy lawn that you are proud to call your own. From watering your lawn to the homepage.